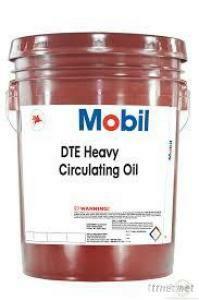 Mobil DTE heavy oil is of high quality cycle oil, a highly refined base oils and a high chemical and thermal stability, with water quickly and completely separated, and easy emulsification additive modulation. Features and Benefits: high chemical and thermal stability, prevent sludge and varnish formation; excellent performance of the watershed; good wear resistance; long-term to prevent corrosion and corrosion; Strong resistance to foaming and air release performance; versatility strong wide use. The series seeking lasting lubrication device Modulation: land-based and sea-based steam turbine, hydro turbine and some gas turbine circulation systems, including pumps, valves and other ancillary equipment; continued sliding and rolling work column bearings, parallel shaft gear; to splash, bath, oil, oil rings or other mechanical means of turbine; moderately hydraulic pumps for harsh.